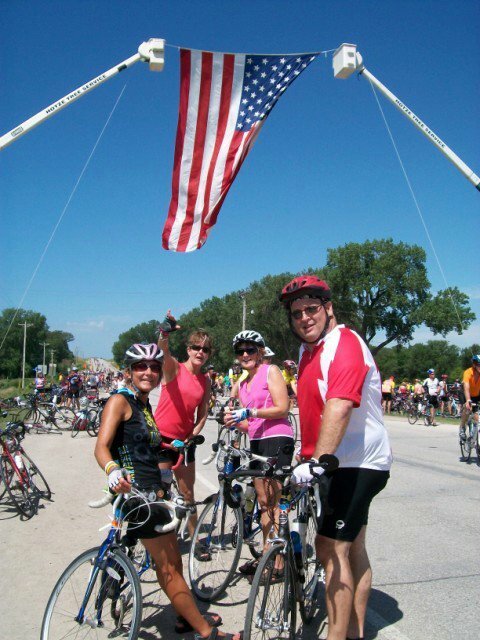 A thorn among roses: Linnea Maxwell, a biking from friend from Arizona, took this photo of me last year on RAGBRAI with, from the left, Diane Olson, Marnee Acker and Paula Durham, all of Muscatine. The Des Moines Register's Annual Great Bicycle Ride Across Iowa will begin this year on July 22 in Sioux Center. Emails and text messages have already been sent and received with the kind of regularity not normally known in eastern Iowa in March. They all go something like this: Meet at 5:30 p.m. Wednesday for an out-and-back ride with food and margaritas to follow at Guadalajara.These social rides have helped me ride some 250 miles this month, more than I’ve ever ridden before in March and a good chunk of the 1,000 or more I like to have done every year before RAGBRAI rolls around the last week in July. So the early beginning to Muscatine’s biking season made me pause a bit longer today to read an alert from Twitter about something called 30 Days of Biking, which has started following me on the online social-networking and micro-blogging service. The biking organization, which was formed in 2010, calls itself a community of joyful cyclists. Its goal is to get cyclists to tweet about their bicycling adventures April 1–30 with the hash tag #30daysofbiking. Sounds like it could be fun. And it will give me an excuse to drive my biking friend, Dan Rose, a little nuts every time I pull out my phone to tweet about a ride. If for no other reason but that one, it would be worth doing as often as possible. One more biking story: One of my brothers and his wife bought bicycles this week and started riding. This is great news. I hope they keep at it long enough so that we can all ride together sometime soon. Maybe down the road I can convince them to park the Harley long enough to give RAGBRAI a try. This and that: Much has already been written and said about the $500,000 bonus Mary Junck, the chief executive of Lee Enterprises, received for quickly leading the company through the bankruptcy in which, it should be pointed out, Lee found itself in under her leadership. Lee is the parent company of the Muscatine Journal, where my job as editor was eliminated as part of a February budget-cutting move. If someone says or implies I was let go for other reasons, they are not being truthful. Anyway, I worked 21 years for Lee Enterprises and some friends have asked me about Junck’s bonus. So many snarky comments have already been made by others that I’m not even going to link to them. Go look for them if you want. They aren’t hard to find. Here is where I’ve come down on the subject: It is a good opportunity to practice what I’ve preached to others many times through the years. It is not something over which I have any control, so I’m not going to waste a lot of time worrying about it. It’s always better to focus on the things you can change. For me, that means to keep working on becoming healthier and to keep doing things that will help me find an even better job for the next phase in my life. I always respected Mary Junck, but she doesn’t have a place in this equation. And neither does her bonus. Well said on the bonus. She’s just hired help too, higher paid but with (probably) less less job security, doing the job she was hired to do.